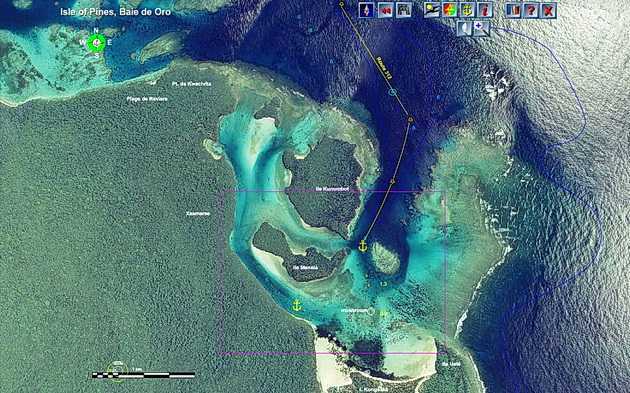 New Caledonia has excellent nautical charts and navigational markers. 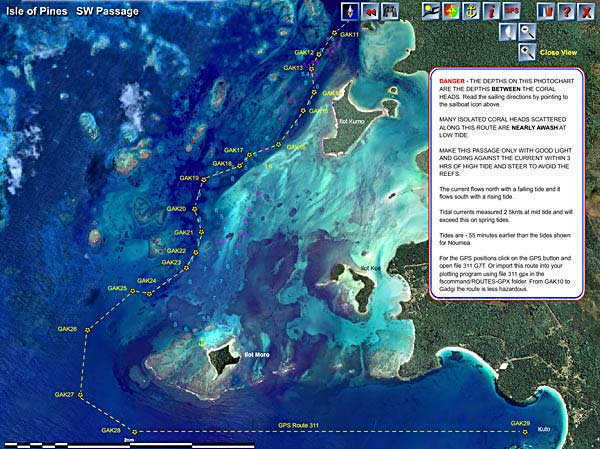 With a few exceptions most of the marine charts for New Caledonia provide details suitable for shipping and larger vessels but when it comes to tight little remote anchorages that yachts will want to anchor in the details and dangers just are not there. 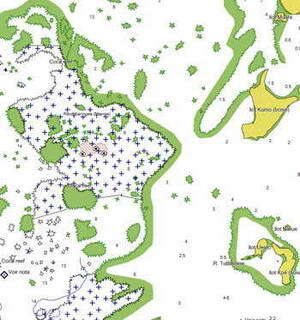 Our Nautical Guide to New Caledonia lists all the French Hydrographic Charts for New Caledonia and you can buy these charts in Noumea or order them from most of the larger chart suppliers. Makers of electronic charts - like Navionics, C-Map, and Garmin - have copied the details for their charts directly from existing marine charts with the actual data often dating back to charts made over 50 years ago. So they, too, often lack the kind of details in shallow water that yachts need to have for safe anchoring in remote areas. Many boats are now supplementing their electronic charts with satellite views from Google Earth. This helps but there are, of course, no depths given in the Google Earth images and many areas have clouds hiding critical reefs and dangers. Google has also taken to erasing offshore reefs so you could easily get in trouble using these without proper charts or local knowledge. Our cruising guide to New Caledonia will give you the kind of local knowledge and detail you need to assure you can navigate and anchor safely in New Caledonia. 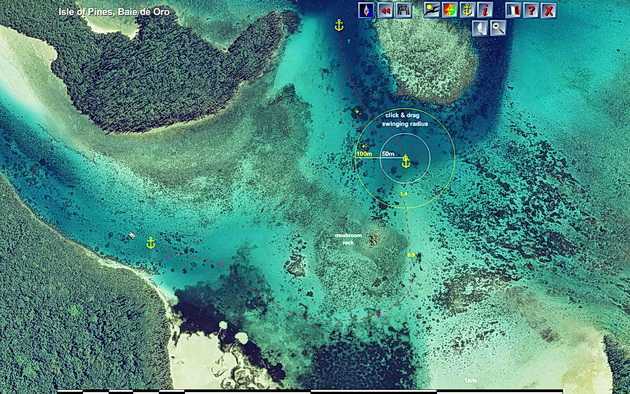 We personally have done the critical detailed hydrographic surveys using a GPS coupled depth sounder mounted in our dinghy and carefully plotting the depth contours and marking dangerous isolated coral heads. What you see on the guide is what you get when you arrive. Let me give you some examples comparing the various charting options for New Caledonia. 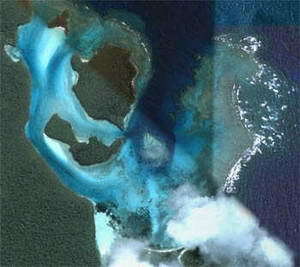 Navigation along the west coast of Isle of Pines is complicated by a shallow area that has thousands of isolated coral reefs. If you don't have local knowledge you could quickly get into trouble here. 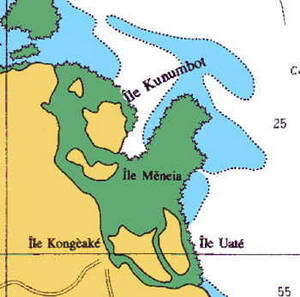 Without our guide your options to go between Gadgi and Kuto are to go 46 nautical miles around the east side of Isle of Pines - often very rough waters, or make a 40 nautical mile detour west, out the turbulent Passe de Sarcelle and tack back into the SE winds to Gadji. If your vessel draws less than 3 metres, our cruising guide will show you how to go from Kuto to Gadji in flat calm waters and the distance is 13 nautical miles. 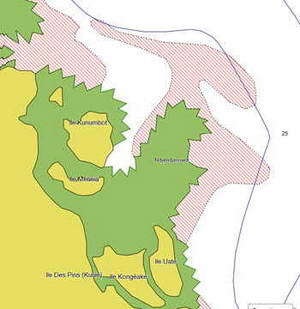 Using the official paper chart you would really put your vessel at risk attempting to pass through this area. Not just because there are thousands of uncharted coral heads, but also because there can be a 2.5 to 3 knot current flowing past them and you need to know which direction the current is flowing and when. 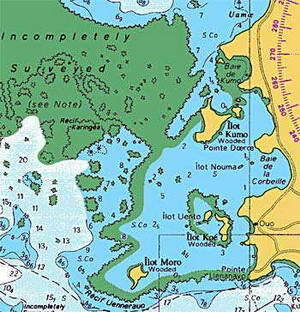 With the level of information found on the electronic or paper charts you would be nuts to try this passage to gain access to the lovely cruising and diving areas along the NW coast of Isle of Pines. Many yachts use Google Earth to provide actual images of the areas where the charts don't have enough detail. But Google Earth does not provide depth information and often there is surface glare or clouds obstructing critical dangers. 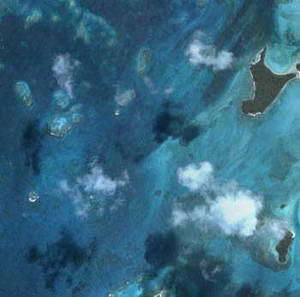 Even worse, Google erases isolated reefs in many areas. And you would still not know about the tidal currents. Believe me, if you were heading through this area with a 3 knot current in the same direction you were going it would be impossible to stop if you got into a tight spot. 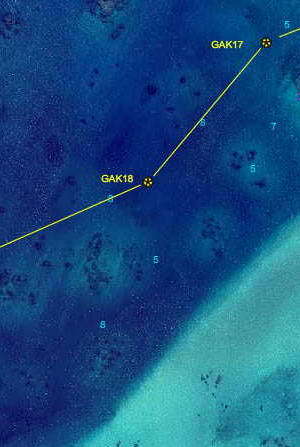 Now THIS aerial photograph, route and depth information is good enough for you to navigate safely through this area. What you see here is a very reduced example of the extremely high resolution image you will see on your computer screen. The depths on our guide are adjusted to mean low sea level and of course we provide you with the tide information for this area so you can plan your trip going against the current - thus giving you time to respond to signals from the person on the foredeck watching out ahead just in case you get off course. You won't find this level of information anywhere else, and this is just one small example of how our guide will make your voyage to New Caledonia safer, easier and more fun. 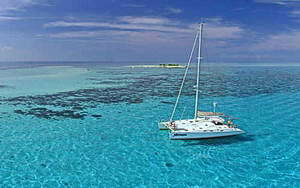 Now lets look at an anchorage chart for New Caledonia. The Baie de Oro is on the NE coast of the Isle of Pines and there are some interesting places to explore in this area, including nice beaches and the famous natural swimming pool (and some good restaurants too). One reason some anchorages are not properly surveyed is that they are too difficult for a survey vessel to get into to do the survey. This particular anchorage was never properly surveyed. This is what you will see on the latest electronic charts of the same area. No surprise here, if it wasn't surveyed to begin with, the electronic chart does not have anything of value either. Well, this is more like it. But you have no way of knowing what you will find in the way of depths, or exactly the best sandy areas to drop the hook. These images are greatly reduced from the full screen images you will see on your computer so while they look OK here they will knock your socks off on a high resolution screen. See that circle around the center anchor icon? That's a swinging room measuring tool. Click and drag it to where you think you want to anchor and you will see a 50 metre and 100 metre circle around that location so you'll know how much swinging room you have. If you click on the information i icon you will find details on mobile phone (and Internet) reception, TV reception, beach, natural swimming pool, and the Meridian Hotel. Plus you'll find a lot more information about what you can do ashore in the companion Travel Rocket Guide to New Caledonia. For more examples on what to expect from the anchorage charts on our cruising guide click here. It's your vacation, your boat, your friends and family, if you want the best information for your security and safety when cruising in New Caledonia order the Rocket Cruising Guide to New Caledonia right now and start planning your cruise.